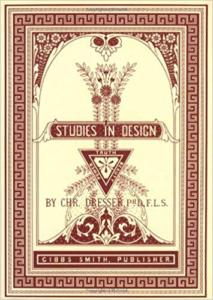 A third generation modern designer, Christopher Dresser (1834–1904) was the successor to the great British reform designer, Owen Jones, who had been the successor to William Morris. Dresser was a prolific designer and much of his work was highly decorative and very ornamental. But, he was also a precursor of modern design for his use of simple forms and shapes and straight and strong lines. In contrast to Mackintosh for whom straight edges were an aesthetic, the work of this Scottish designer—Dresser—can be considered a reference to the machine. In fact, he has been called the “first independent industrial designer.” However, his practice was an aesthetic split between Victorian exuberance and his lean and mean designs so modern we would assume they were invented yesterday. In fact, Dresser himself was a thoroughly modern success story. He came from a humble background and was trained, from the age of thirteen, as an artisan at the Government School of Design. As his educational background attested, his tenure at the School was that of a commercial designer, not a fine artist. But Dresser rose above the rank for which he was intended and, due to his study of flowers for ornamentation, became a well-known botanist. According to a review of Christopher Dresser 1834-1904: A Design Revolution at the Victoria and Albert Museum in 2004, “His approach to decorative ornament was to stylise natural forms, finding the underlying geometry of a plant or flower and then turning it into abstract or semi-abstract pattern.” His drawings for his lectures broke the geometry of the flower down into component parts, leading to the “scale, simplicity and clarity of these early drawings,” which lead to his abstract design. The great peculiarity this tea-drinking ceremony consists in the exactness with which everything is done. A spoon, cup, ladle, or whatever is handled, has to be taken hold of in a particular way, set down in a particular place, and touched in a particular part; and everything is done with the same stance precision. What i saw was part of the ceremony of “thin tea-drinking,” and part of the ceremony of “thick tea-drinking;” but the whole is simply a lesson in those laws of politeness, which were formerly so rigidly extracted in every mansion and on every state occasion, and which are largely kept up in the houses of the old aristocracy. Dresser was making the point that design was now the province of artists whose job it was to elevate the taste of the masses through good design, which, for him, included both ornament and decoration. No matter how rectilinear and simplified his designs became, Christopher Dresser never questioned the importance of additive motifs. In an 1874 lecture, “Eastern Art, and its Influence on European Manufacturers and Taste,” Dresser specifically put ornament and rationalism together: “The ornamentist should stand between the pure artist on the one side and the utilitarian on the other, and should join them together. He should be an artist in every sense of the word, yet he should be a utilitarian also. He should be able to perceive the utmost delicacies and refinements of artistic forms, yet he should value that which is useful for the very sake of its usefulness.” This is a very interesting discussion for Dresser was very interested in understanding how beauty and “utility” worked together. 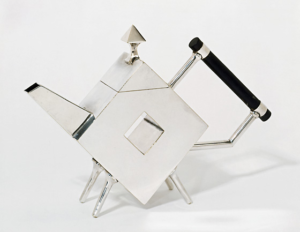 The idea of “beauty” would not be addressed by early twentieth century designers, but Dresser was very concerned with how good design resulted in what he called “beauty.” The example he used was a tea kettle and a Turkish samovar, a large container for hot water, often used in England for tea. 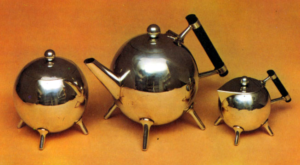 The kettle in question was an example from Japan, a major source of inspiration for Dresser who commented, “It is curious that while the kettle is an object in use in every house in the land, we have to go to Japan to learn how to make one as it should be made. But we are a pig-headed, self-opinionated people, who blindly persist in our ignorance. We do not give though to what we do, but insist upon doing those things which our fathers did, just as our fathers did them.” Dresser had visited the London Exposition of 1862 where he saw Japanese art and artifacts. Like many artists and designers of his generation, he became enamored of Japanese design. Japanese design was in fact quite elaborate but what Dresser learned from the exhibition was the importance of shape and the necessity for the material selected to be suitable to the form. Of course, Dresser would design his own tea sets. He worked with various manufacturers, usually using silver and often ebony for the handles. One of the characteristics of his work in the 1880s was the smooth surfaces, wiped clean of the crusts of hammered out design. The tripart set he did for James Dixon & Sons, Sheffield in November of 1880 was assembled out of the most simple components, three circles for the tea pot, the covered milk container and the sugar dish with domed lid. To offset the spheres, the ebony handles on the pot and milk jug were simple straight lines, and the set of legs on each vessel were slim and splayed delicately. There is also a matching coffee pot which, as was historically customary, dating back to George Berkeley, was tall and oval with the same distinctive straight handle and tiny legs poised like a ballet dancer en pointe. Dresser did some sixty designs for Dixon, but not all of them were manufactured and stayed, perhaps because they were too radically plain, on the drawing boards. It would be incorrect to understand this extraordinary set of square pots in terms of industry and manufacturing only. Dresser was a product of the Aesthetic movement and was an inheritor of the reformist desire to reform middle class taste and to transform the prevailing definition of “beauty.” In contrast to Victorian elaboration of everything and ornamentation upon anything, Dresser’s designs combined form and function with a new sense of beauty lying in the purity of a simple geometric shape, a circle or a square. 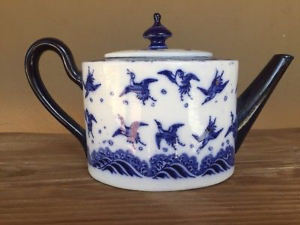 On the rare occasions when he did engrave his tea sets the designs were spare and geometric, nothing natural, only straight lines and a clean pattern repeating the shapes themselves. Dresser may have been hoping the newly adventurous middle class with some amount of disposable income would be interested in buying something untraditional but he was careful to put art first and manufacturing potential second. Today these severe and unexpected tea services are still contemporary. The design of Christopher Dresser manifested themselves in ways the artist could no have imagined: the tea pots glided from century, fitting neatly into Art Deco, Mid-Century and the twenty-first century, ageless and timeless. That quality of always being contemporary and dateless is very rare, but good design should be always satisfying and complete as an artistic expression.